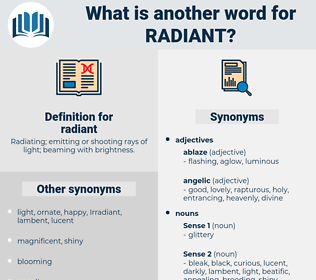 What is another word for radiant? 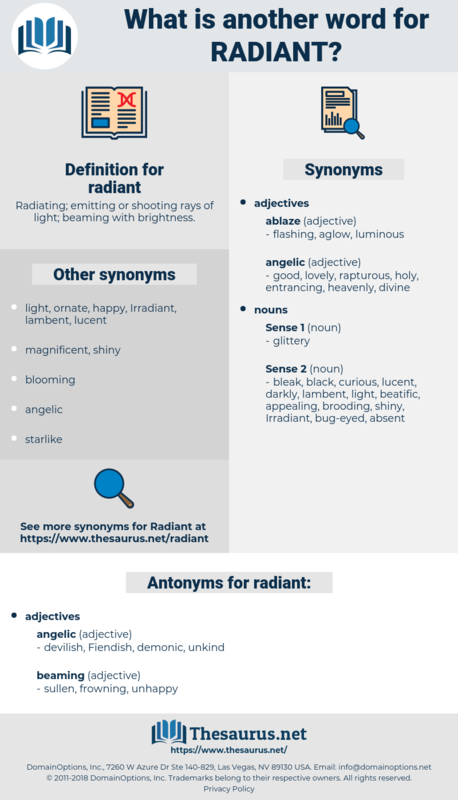 Radiating; emitting or shooting rays of light; beaming with brightness. radiological, glowing, Irradiated, vibrant, glorious, radiating, lovely, great, spectacular, shining, energetic, rosy. homely, ugly, disgusting, grotesque, repulsive, offensive, unattractive, hideous, plain. dim, cloudy, dark, dull, sad. glaring, darkening, sunless, melancholy, glum, tenebrous, listless, depressing, blank, pitch-dark, scowling, lackluster, stoic, glowering, unemotional, palish, pale, blackened, leaden, pitch black, gray. Blessed is he who can watch and reflect this radiant look. Man they desired, but mind you, Perfect Man, The radiant and the loving, yet to be!